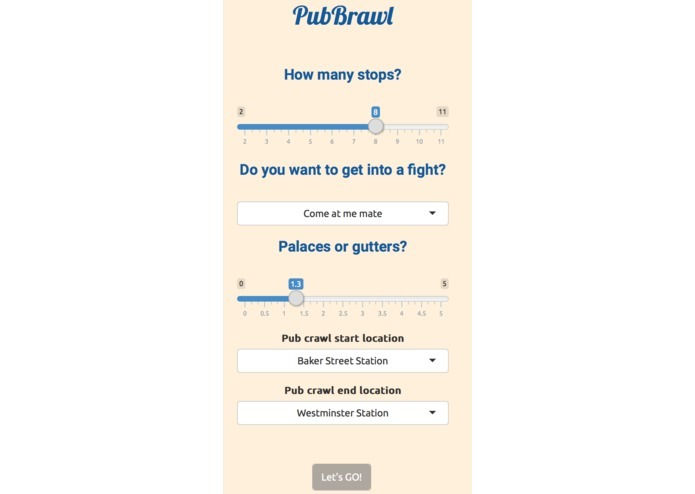 Are you bored by your local pubs? Do you think your neighbouring pubs are too boring? You already tried all the "popular pubcrawl lists" out there and they left you disappointed and empty hearted? Wander no longer, my friend! The solution arrived. To be more precise, the solution to get you to your favourite solution just got updated to the 21st century! 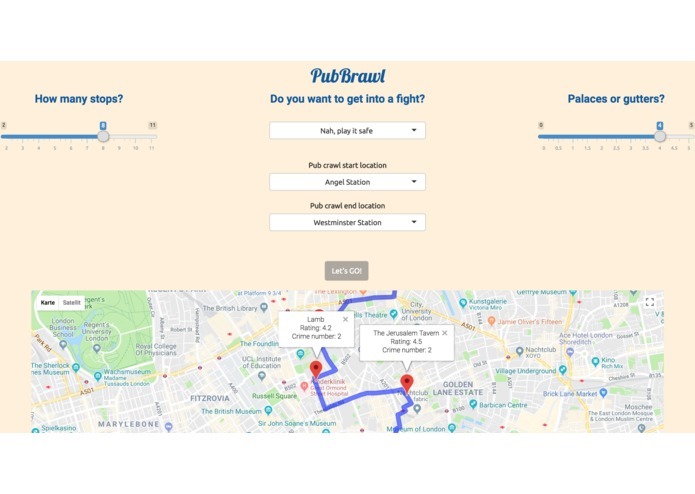 Here we present PubBrawl, the probabilistic pubcrawl engine integrating latest Google Reviews and Police Street-level Crime Rates in order to deliver you a personalised route which will definitely end you up in a bar fight. And all of this by connecting your start and end point to two tube stations of your choice. Surely, We won't leave you alone out there in this dark world. 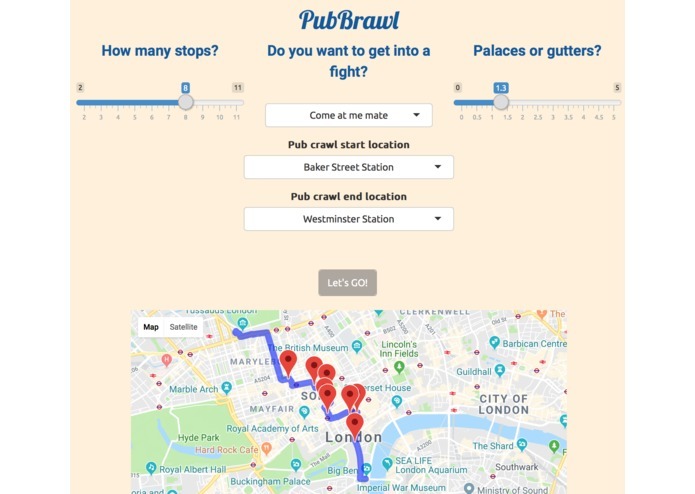 Our concept is that the novelty of choosing a pub crawl that might get you in a fight, or choosing a pub crawl based on the bars with the lowest reviews, will be fun and interesting enough to get people thinking about safety on their nights out. Information such as nearest A&E is a useful thing to have in the back of your mind when organising a big crawl as it is always good to be prepared. We were also motivated to find a good way to find new bars for us and our friends! We built the app in R using Shiny for the front-end user interface. Data from the Police API, Google Maps/Places API and NHS Hospital Data were integrated to generate risk profiles for each pub, with a probabilistic selection guided by the user input. The shortest past was calculated and plotted on an dynamic Google Map. Challenges we ran in to. Shiny was a challenge to implement. We were unable to get Shiny Server and Amazon AWS EC2 working together, so this is still a work in progress. A working app, we will all be using for 4/5 Hackathon newbies, all coded in R! This is a tongue-in-cheek product and the creators accept no responsibility for your misadventures!